The previous owners of my house ran a small business from the converted garage, which I’ve used as an office and storage space for the last few years. But now I don’t need a big office, I’m able to create a room for a small home cinema. So I bought a magnificently large TV screen, did some basic sewing to create thick black curtains to hang behind the screen from ceiling to floor and, with the help of a good friend who’s very clever and had several days to spare, a truly amazing sound system’s been connected. Add a few old posters of scenes from Casablanca which I’ve kept for years (is that not one of the best films ever?) 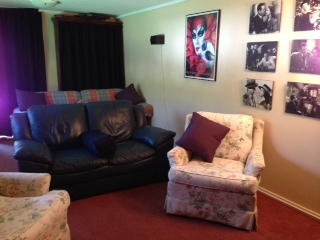 plus comfortable couches and it now seats six easily. With a platform to elevate the back row it will eventually seat more. I like to think it has the atmosphere of an old-style cinema. 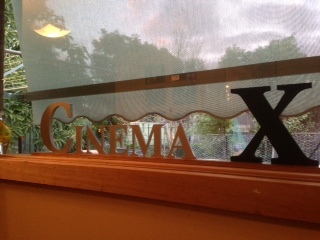 So my Home Cinema is up and running – and even has a name. While I toyed with calling it Cinema Paradiso (there’s another great film), a friend pointed out that as our town has a nine-cinema complex, perhaps it should be called Cinema Ten. This entry was posted in Books, Music and Films, Try Something Different and tagged My Home Cinema on August 18, 2012 by outsidethesquare101.